The 43rd experiment in the ISRO PSLV series has been successful.On Thursday, at 4.04 am, IRNSS-1 satellite was launched by PSLV-C41 rocket from Satish Dhawan Space Center in Sriharikota, Nellore district of Andhra Pradesh. 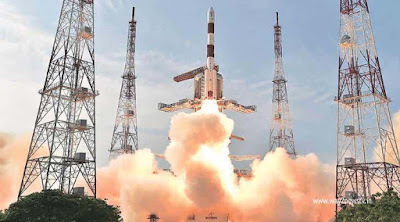 After completing a 36-hour countdown, at 4.04 am the rocket flew to the sky through the first launch pad.as the part of NAVIC (Navigation with Indian Constellation) project by ISRO ,IRNSS-1I satellite was sent to space, to get the availability of country own navigation system.this is an Eighth Satellite in this project. also the last satellite. Already successfully launched seven satellites into orbit. All these are landing at an altitude of 36,000 km above Earth. IRNSS-1I weighs 1,425 kg. The rocket height is 44.4 meters and the total weight is 321 tonnes, including satellite and payload. The launch time was 19 minutes 19.6 seconds. All four phases were introduced into the orbit of the satellite. The Bharat had its own guiding system. Currently we are relying on the American Global Positioning System (GPS) for our country needs. ISRO has created Navy to use the strategic use of the military as well as public needs. The total cost of the project is Rs.2,246 crores. Soon the number of satellites in this project will be increased from 8 to 11. ISRO has decided to expand Navy's services to the airline as well. The launch of GSAT-6A satellite in ISRO last month was initially successful, but after that the satellite was strained. ISRO scientists celebrated the success of ISRO's latest experiment. ISRO has intended to create an autonomous system in the name of the IRSSS in the form of American JPs. This was later named 'Navic'. With this system, state, compass, and time services will be available reliably. These services are available within India around 1500 kilometers. It mainly provides two types of services. One standard status service. The second is controlled service. This will only be for authorized users. This will guide the ground, stand and sea. Disaster management can be used to track vehicle traffic, timely tracking, mobile communication with mobile phones, timely accuracy and mapping. Mountaineers, tourists, and vehicle compasses provide visual and vocal compass. Fishermen who have been fishing in the sea for days away from the coast are getting access to IRNSS through key services.